I started writing this post at the beginning of 2011, but somehow never got around to completing it, which is a shame because it addresses something that I think is absolutely essential for good health – ACCOUNTABILITY! A bit ironic, right? I’m about to preach about accountability, and I can’t even motivate myself to blog as frequently as I’d like. But, I promise I have good reason. I have been spending much of my time this year studying to complete a master’s degree in Integrative Health and working on my own personal health through daily exercise (of mind and body). I even have the documentation to prove it (for the exercise that is, the degree won’t be done until August). 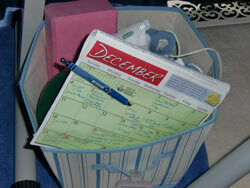 The proof I speak of is perhaps the most powerful tool in my fitness arsenal – a calendar. As justification that some of the best things in life are free, my 2011 calendar was sent as a gift with my annual donation to the American Institute for Cancer Research. And, what a gift it was as it has served as a constant reminder of my goal to exercise daily, or at least 5 times per week. When empty spaces started to appear, I knew that I needed to get moving. At the beginning of the year, I stuck mostly to my favorite yoga and Pilates routines, either following along with Exercise TV on Comcast On Demand, or using my favorite DVDs. After I completed a session, I wrote it down on the calendar. The simple act of documenting my progress was very rewarding and empowering. As the year progressed, and my calendar spaces began to fill, I opted to mix things up, heading outside for hikes, trying strength training, playing Wii Fit, and my latest Wii favorite – Just Dance 2, which has proven to be quite the fun cardio workout! The key is that I never got bored and never really saw the exercise calendar as something I had to fill, but rather embraced it as something I wanted to fill. 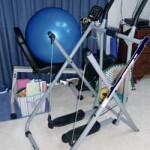 The full home gym complete with exercise basket, Gazelle, exercise ball, and recumbent bike. Running Sneakers – a good pair of sneakers is crucial for preventing injury when doing cardio exercises like running, dancing, or aerobics. I have a pair of inexpensive Asics ($30) that I purchased at Kohl’s a few years ago. I only wear these indoors which has kept them clean and minimized their wear-and-tear. Running sneakers seem to have the most support and cushion, although cross trainers are ideal as well. Hand Weights – the pair I use is only 3 pounds, but enough weight to challenge my muscles. Exercise Bands – I love exercise bands because they are so portable. The set I use now was only $2 at Target. They are great for strengthening the back and chest muscles. Mini Exercise Ball – I must admit it, I bought the Bender Ball! It is actually a pretty helpful piece of ab equipment. The exercise DVDs with the ball are easy to learn and do a great job of working the whole abs. Yoga Blog & Strap – The beauty of yoga is truly how little it requires.I rarely use anything more than my own body when I do yoga routines, but it doesn’t hurt to have a block or strap available for new or especially challenging poses. As you can see by the above photo, I also have a Gazelle. Yes, that is the very one sold by Tony Little! With the Bender Ball and the Gazelle – you can see that I am not immune to infomercials. But, I really do enjoy both pieces of equipment. Although I don’t use the Gazelle as much as I had hoped, it does provide a smooth, quiet cardio workout. Sometimes I will use it while watching TV, or as a means of stretching my leg muscles. 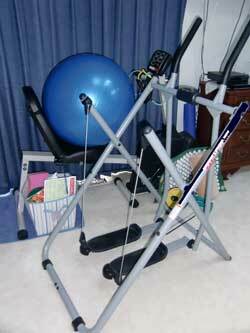 The biggest dust collector in my exercise arsenal is of course the most expensive – my recumbent bike. It was one of my first big purchases when I lived on my own, making it a bit of a sentimental item. Back in those days I hadn’t discovered yoga or Pilates, so simply hopping on the bike and peddling away was a chore, but an effective workout none-the-less. If I had to give up one piece of equipment, that would be it, but my husband uses it occasionally, so for now it stays. I think the biggest challenge to maintaining a steady exercise routine really is a lack of commitment and accountability. If you don’t commit to doing some form of exercise every day, and then hold yourself to it – with a calendar, a planner or even an exercise app – then it is very easy to just let it go all together. That is of course, unless you grow to love your exercise routines. Because when exercise is an enjoyable part of your life, you want to do it. 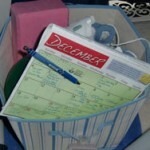 So, for the coming year, I encourage you to give exercise a try – whether it be walking, dancing, swimming, active video games, or one of my favorites – yoga or Pilates – there is bound to be some activity that will fill up your calendar in 2012. I have been looking for an effective way to hold my self accountable and I love your idea of filling in an exercise calendar! I think this will be good for me too. Thanks for taking the time to share this article. You are very welcome Rita! I hope you will find it as helpful as I have.